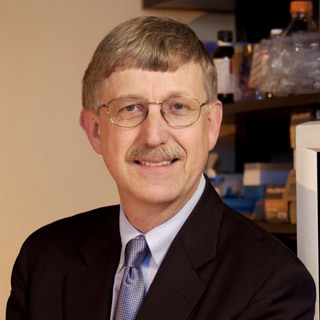 Dr Francis S. Collins M.D., Ph.D.
Francis Collins is a physician and geneticist who spearheaded the Human Genome Project, and who has made landmark discoveries of disease genes. Under his direction, the Human Genome Project produced the first finished sequence of human DNA in 2003. Collins founded the BioLogos Foundation in November 2007 and served as president until August 2009, when he was confirmed as the 16th Director of the National Institutes of Health. Collins received a bachelor's degree from the University of Virginia, a doctorate in physical chemistry from Yale University, and a medical degree from the University of North Carolina. In November 2007, he was awarded the Presidential Medal of Freedom, and in October 2009, Collins received the National Medal of Science. He has been elected to the National Academy of Sciences and the Institute of Medicine. Collins authored the New York Times best-seller, The Language of God. His most recent books are Belief: Readings on the Reason for Faith, and The Language of Science and Faith (with Karl Giberson).